NH Industries has delivered the 300th NH90 production helicopter to the Spanish Armed Forces last December 15. Assembled at the Airbus Helicopters Spanish final assembly line at Albacete, the aircraft will be operated by the Spanish Army’s aviation branch, Fuerzas Aeromóviles del Ejército de Tierra (FAMET). “Delivering the 300th helicopter to the Spanish customer is a key milestone for the NH90 Program. We plan to advance further by unveiling innovative growth options in the future, and our customers can be assured of our commitment to provide outstanding Support Services to our front-line operators,” said Vincent Dubrule, President of NHI. “This achievement opens the way to new opportunities for this state-of-the-art helicopter. The impressively wide spectrum of missions performed by the NH90 makes it one of the most attractive military helicopter on the market, and it will remain so for many more years,” said NHI Managing Director Gianfranco Sottotetti. To date, 515 NH90 helicopters have been ordered by military operators in 13 countries, and the global in-service fleet has logged over 120,000 operational flight hours. The NH90, originally launched as a joint programme between France, Germany, Italy and The Netherlands, welcomed Spain as a new customer in 2007. It was designed from the beginning to meet the diverse operational requirements of the partner Nations, ranging from battlefield missions such as transport, special operations, medical evacuation and combat search and rescue, to naval missions such as search and rescue, and anti-submarine (ASW) and anti-ship (ASuW) warfare. 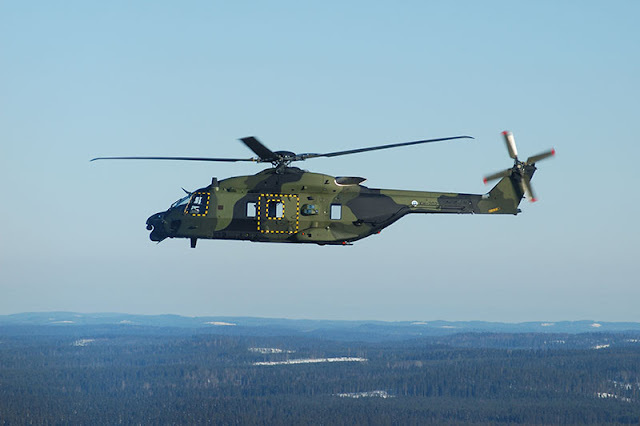 Designed for maximum operational flexibility, the basic NH90 composite airframe, which is fitted with redundant fly-by-wire controls, is produced in both Tactical Transport Helicopter (TTH) for army missions and NATO Frigate Helicopter (NFH) for naval missions. The basic airframe can be adapted to customer requirements by using a raised cabin or by fitting a rear ramp, and by using mission equipment packages offering different combinations of sensors and weapons tailored for each type of mission. The two versions of the NH90 – TTH and NFH - are in service in Australia, Belgium, Finland, France, Germany, Greece, Italy, New Zealand, Norway, the Netherlands, Oman, Spain and Sweden. The NH90 helicopter program is managed by the NHIndustries, a joint venture company owned by Leonardo (32%), Airbus Helicopters (62.5%), and Fokker, a business unit of GKN Aerospace (5.5%).